I would like to congratulate Brett Mackenzie on completing his Kapap level 2 Self defence instructor certification. Brett traveled to the Avi Nardia Practical Martial Arts Academy Kapap Instructor training being held by Master Avi Nardia at the Ken Akiyama dojo, Koryukan Martial Arts 15 Londonderry Road, Unit 8, Londonderry, New Hampshire. Brett first became involved with Kapap back in 2011 and really liked the way Kapap approached self defence, with this in mind he decided to take the Kapap level 1 instructor course in June 2012. 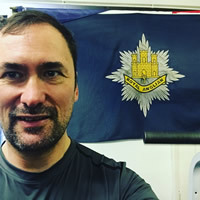 Brett who has over 20 years martial arts experience in different styles including Mauy Thai, Korean Karate, Kickboxing, Krav Maga and Arnis was still a little nervous about what to expect, he needn’t have worried he passed with flying colours. After passing his Kapap level 1 self defence course, he then wanted to open his own Kapap self defence school, this he did after successful completion of competence to teach course. Kapap Great Yarmouth was born, it was not easy at first trying to get a new Kapap club up and running, it had a few trials and tribulations, but through Brett’s hard work and determination has succeeded and has a great club now with great students with a friendly and inviting atmosphere where you are always made welcome and with this determination Brett traveled to America to complete his Kapap self defence level 2 training. It was a hard work involving early mornings and late nights, in his own words the training was hard and was certainly put through his paces as well as having the added pressure of not letting himself down or his students, as it was his personal challenge to succeed. Well I am glad to say Brett completed the weeks Kapap level 2 self defence course, even if he did sustain some bumps and bruises he survived what he called an excellent course. The bonus was that he met and made friends with more like minded people who wanted to take their training to the next level. Congratulations Brett on your achievement.